I enjoyed Christmas time this year. I promised myself that I would not get caught in a pre-Christmas rush and would make sure that I enjoy the time with my family and friends rather than trying to get all the things done the way I like and being left feeling tired and exhausted. I am happy to say that I managed to do just that. I even had a chance to have a few sweet naps with my Little One over the break period who gave up his day sleep a few weeks ago, but felt like napping the last two days. 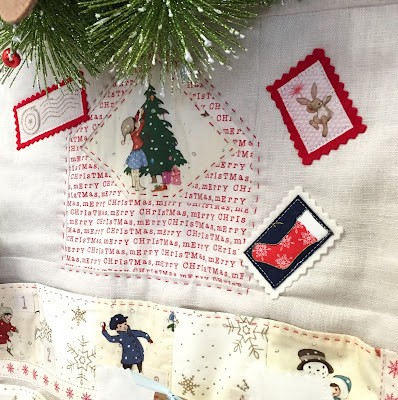 I took my time to do a little bit of Christmas sewing this year that I finished all right on time. I have made my first ever advent calendar that we filled with cookies and chocolates. I ordered Belle and Book fabric called "Christmas" from the official store while it was on sale some time ago. When it arrived I was almost squealing with joy. It's so so cute! 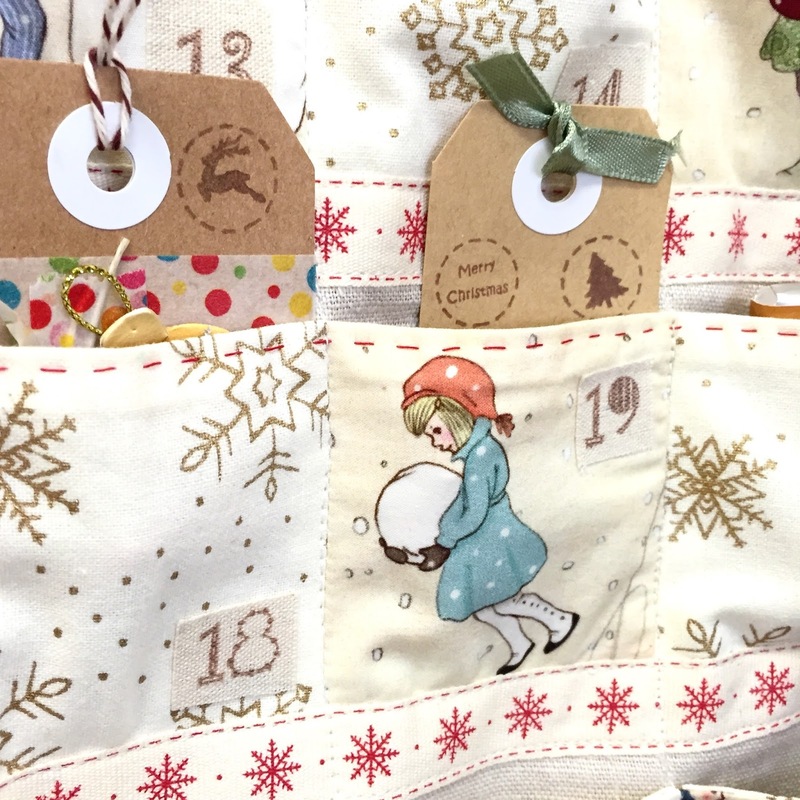 This fabric was a perfect choice for small pockets of the calendar. For the top part I used a paper pieced envelope pattern from the book "Patchwork, Please" by Ayumi Takahashi. I added a few fabric stamps that I made with cotton and felt this time for a more textured look. For the pockets I used two different prints: Belle & Boo and golden snowflakes on ivory background. 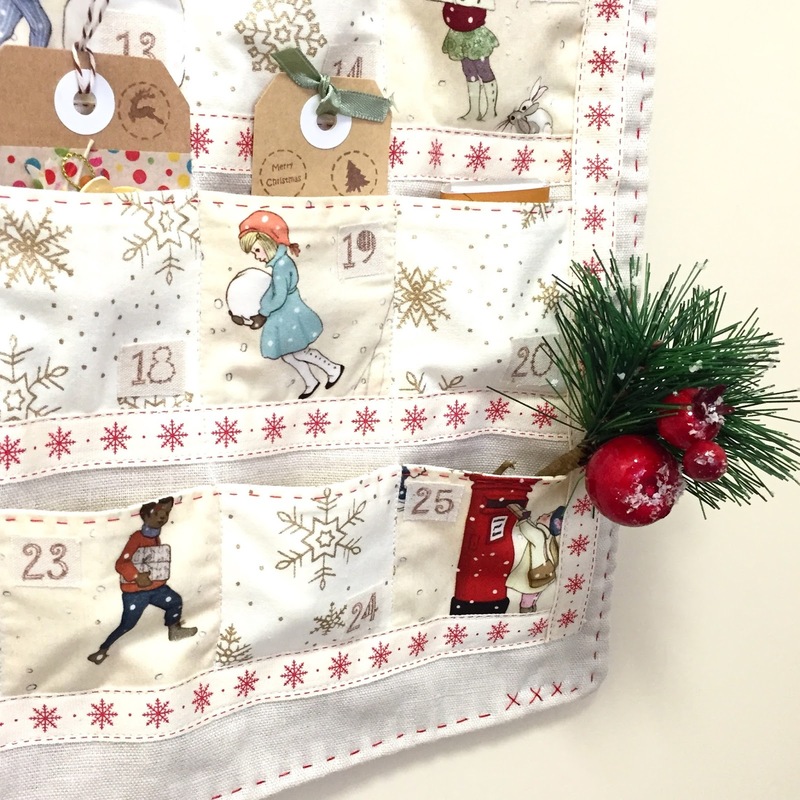 This combination of colours along with linen really gives a vintage look to the finished calendar that I absolutely love. I stitched small squares together in rows of five, then I stitched it together with the back (inside of the pocket) fabric, turned it the right way out and added the running stitches along the top edge in bright red. Once all the five rows were ready, I basted them onto the background. Using a cotton ribbon with red snowflakes, I covered all the raw edges and stitched the pockets in place. After that I stitched between the pockets. 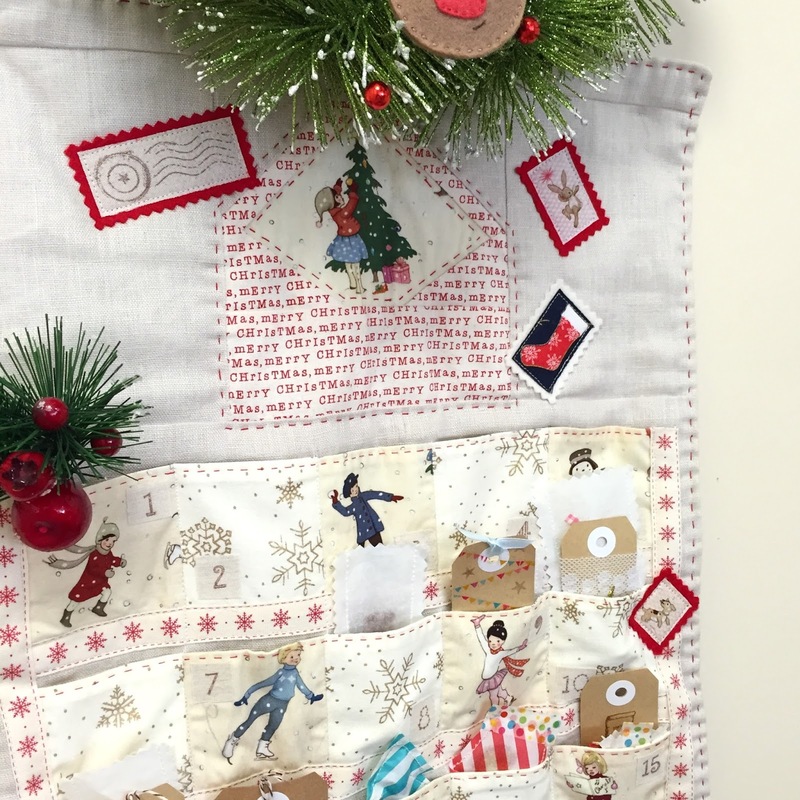 Once all of that was done, I added some hand stitches around the calendar with a few kisses at the bottom and some stitches around the envelope. Nothing complicated, just the most simple design really. Then came the fun part - filling the pockets. I put small wooden toys for a wooden Christmas tree in each pocket and some sweets for the boys. Chocolates and jelly beans for our Big Boy and cookies for our Little Boy. To make sure that the cookies did not stain the pockets and did not crumble inside, I sewed small paper bags using two layers of baking paper and decorated them with washi tape and stickers. That stripy paper was a bag that I used, but it was not as good as the baking paper. It got stained with butter really quickly. Luckily I only made two of these, but baking paper worked really well. I also put paper gift tags in some pockets with small messages or fun ideas for that particular day. For the numbers on each pocket I used calico and stamps. I ironed fusible web on the back side of calico first, printed the numbers, cut it into small squares and then ironed it onto the pockets. Simple! Another festive make that I enjoyed making so much was a set of these three cute Festive Felties designed by Lauren of Molly and Mama. Oh, that Mouse! Peacefully sleeping and probably dreaming of a slice of cheese for Christmas. I made a few changes to the pattern. I used a bead for the berry instead of felt, added sequence instead of using sparkly felt and used a running stitch instead of blanket stitch. Just a few tiny touches to make it a little bit my own. 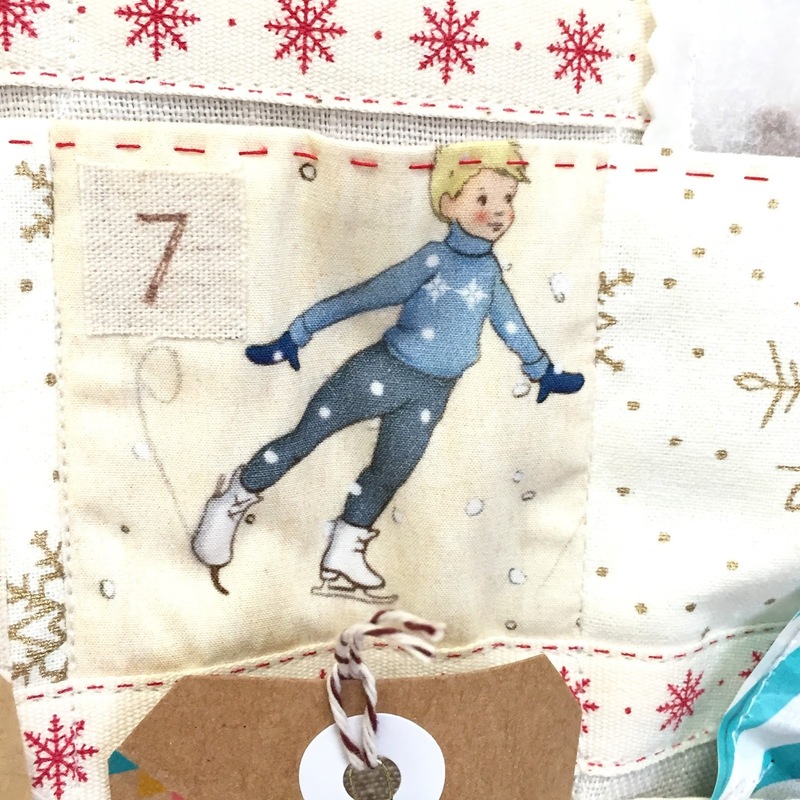 This is a wonderful pattern that can be sewn not just with felt, but with fabric too. You can create gift tags, appliques, tree decorations using this lovely pattern.